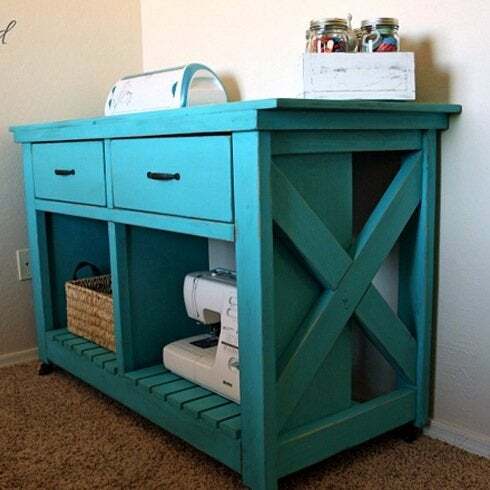 This bright island adds a fun pop of color and much-needed extra storage space in this blogger's craft room. 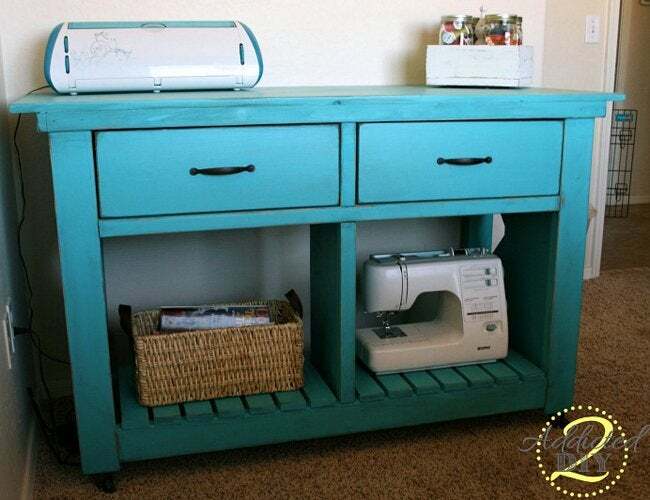 Addicted 2 DIY mastermind, Katie, reimagined DIY island plans to create a focal-point storage spot for her craft room, ideal for stashing unwieldy items like her sewing machine. Discover how she put her personal stamp on this bright-colored beauty. I pre-cut all of my wood before beginning the project and used my orbital sander to sand all of my pieces with 150 and 220 grit sandpaper before attaching them together. There are a lot of nooks and crannies on this project and pre-sanding makes life a lot easier. 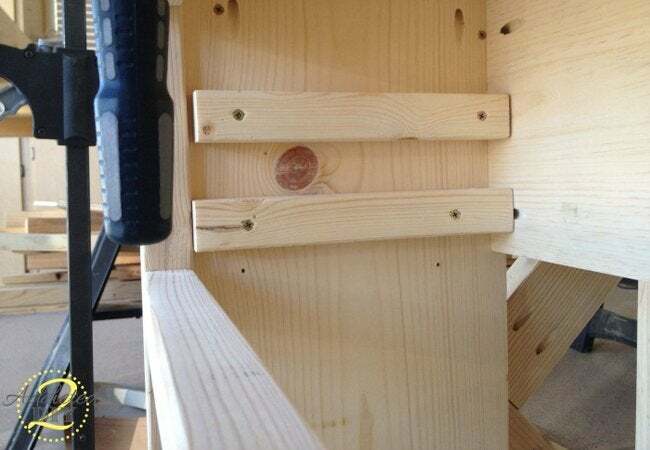 The plans don’t show exactly where to drill your pocket holes with the Kreg Jig, so I wanted to show where I placed mine. 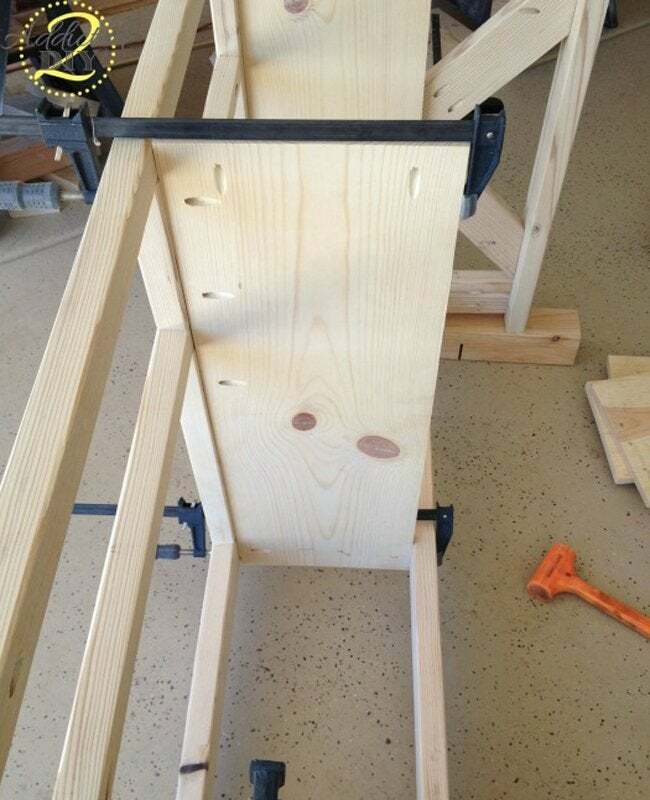 In the plans, it was recommended to also drill 3/4″ pocket holes in the top brace to attach the table top. I found later that after drilling the holes, only one ended up being exposed because of the 1×12 drawer/shelf sides. 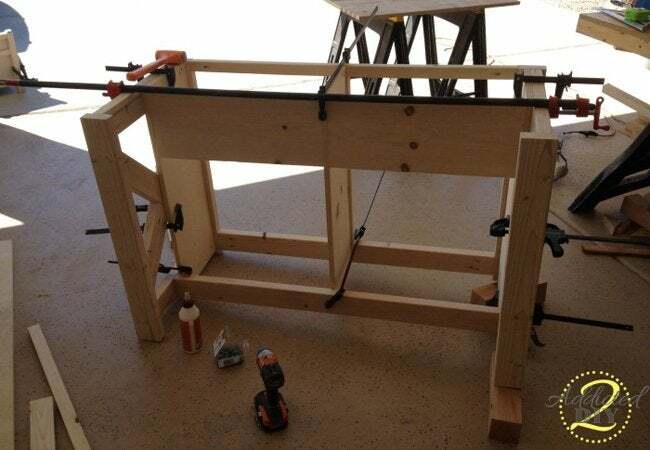 I wanted to have the middle of the tabletop secured to the base, so I drilled 3/4″ pocket holes into the center divider. I drilled these same holes into the drawer/shelf sides on each end of the base. I attached the drawer/shelf sides with 2″ screws and the drawer stops with 1 1/4″ pocket screws. I also used wood glue on all of my pieces prior to screwing them together. 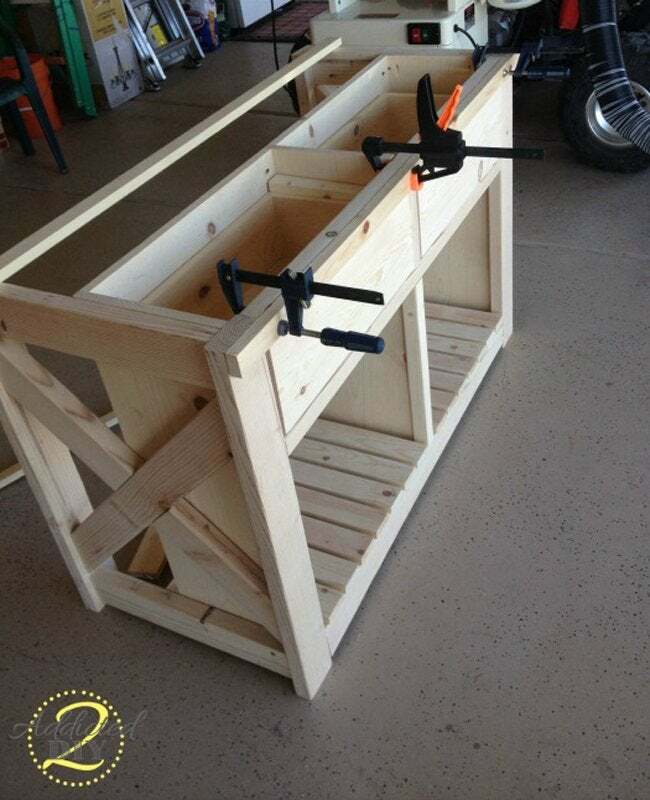 I’ve found with projects like this that you can never have too many clamps. It was a little tough trying to find that perfect gap between the slats that would make them even all of the way across. I tried different pieces of scrap wood, measuring the distance between, etc. I finally grabbed one of my younger son’s old board books and it happened to be the perfect width! 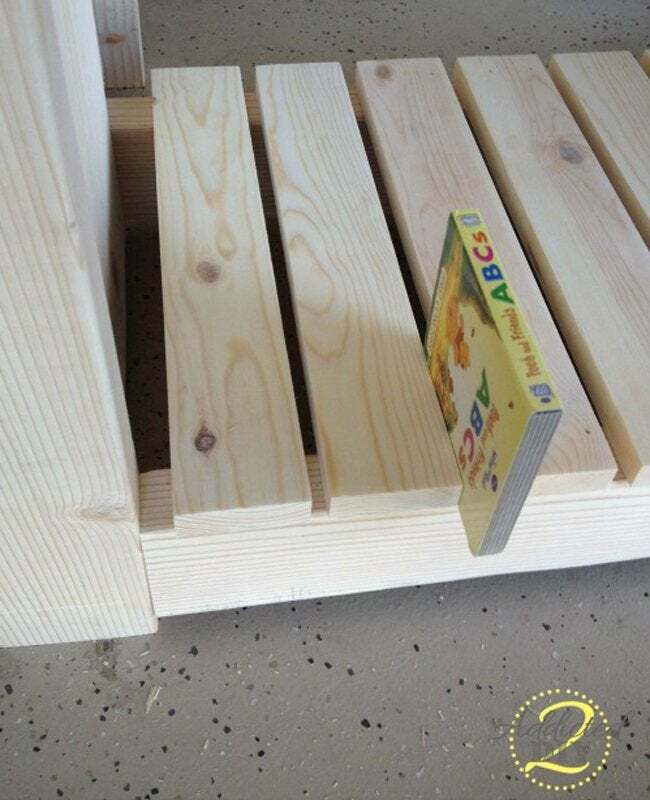 I set my gap on one end, glued and nailed it, then moved the book to the other end of the slat and did the same thing. The drawers were really easy to assemble. I bought a 2’x4′ sheet of 1/4″ plywood for the bottoms of the drawers and ripped those down to size after making the box. I glued and nailed the plywood to the drawer bottoms and sanded any edges that weren’t perfectly flush. 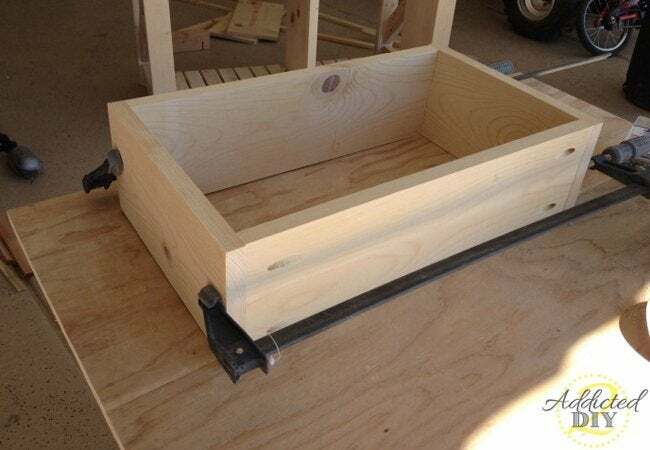 The original plans call for 2×2 pieces to use as a brace to hold the drawers in. I added a second 2×2 above each brace to give the drawers some extra support, so that the drawers don’t fall out when you open them. Since the slides on the sides of the drawers are 1x2s, I cut a small piece of scrap wood an 1/8″ longer than the thickness of the drawer slides and used that as my guide when screwing in the top support. 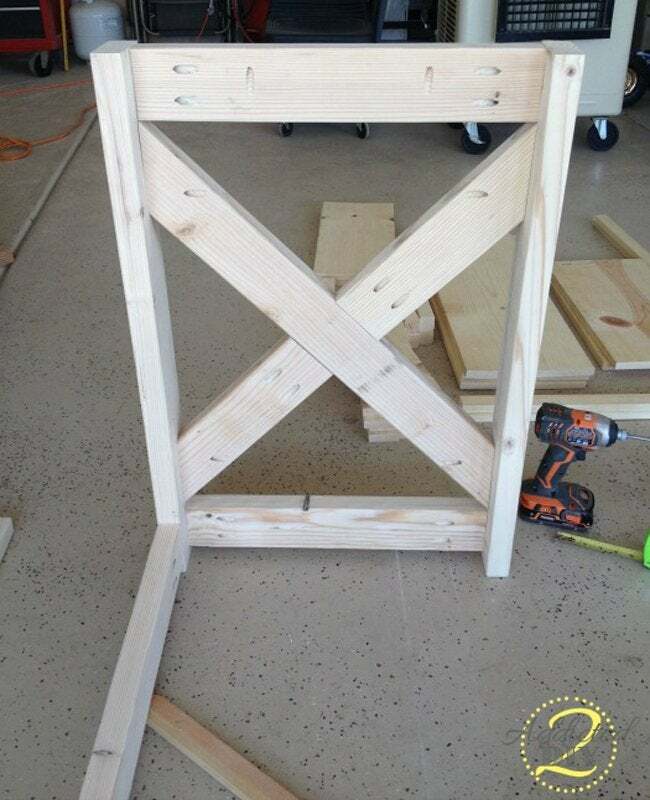 I glued, clamped, and nailed the 1×2 trim to the top of the base and let that set up for a bit. Since the bookcases in my craft room are a very dark color, it took me a while to decide how to finish the island. I finally decided to step way outside of my comfort zone and paint it a turquoise color. I chose Valspar Rushing Stream as the paint color in a satin finish. I knew I wanted to give the island a rustic patina, and this color was exactly what I envisioned. Thanks, Katie! 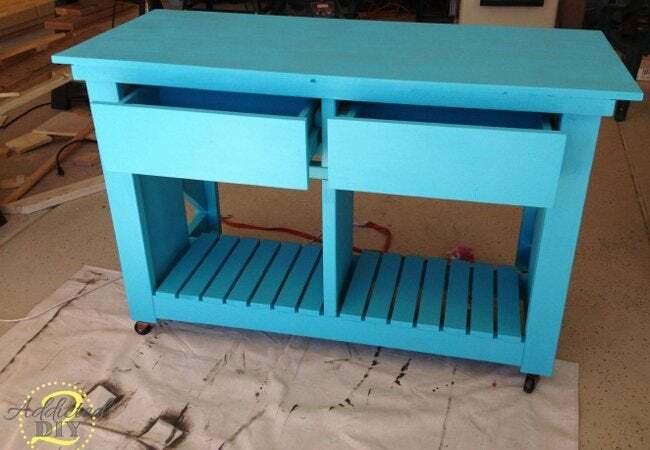 For more colorful projects, visit Addicted 2 DIY.